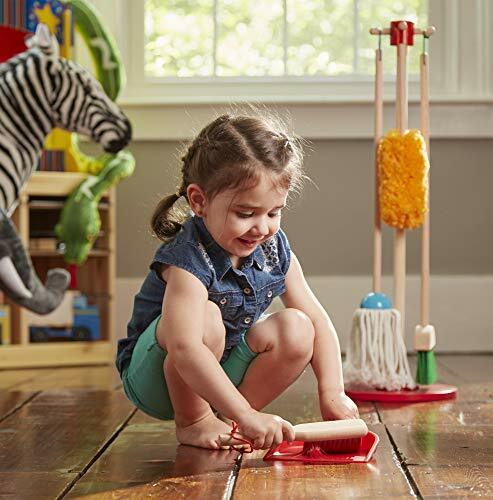 "THE GOLD STANDARD IN CHILDHOOD PLAY": For more than 30 years, Melissa & Doug has created beautifully designed imagination- and creativity-sparking products that NBC News called "the gold standard in early childhood play"
This six-piece play set gives kids all the housekeeping tools they need to keep it clean! Sized just for kids and built to last, the broom, mop, duster, dustpan, and hand brush are comfortable to use and easy to store--just hang them from the sturdy cords on the included stand for neat, compact storage. (The dustpan can also snap onto any of the handles.) Natural-wood handles add durability and a classic look; bright pops of color keeps lots of fun in the mix!